Woodhill Park01263 512242work Holiday, Touring & Camping ParkLocated in a breathtaking cliff top location, Woodhill Park has magnificent views of the coastline and surrounding countryside. It’s the ideal spot to sit back, relax and take in the inspiring natural landscape. Woodhill Park has everything you’d expect to make your stay enjoyable and comfortable. On site we have a small shop and launderette and our large recreation field has a petanque court, tennis nets, football goalposts and crazy golf. We also have a play area which has a sandpit, swings and assault course ...we even have a giant chess and draughts board! For those of you that prefer to bring your own accommodation, we have three areas to accommodate tourers, campers and motor homes. We have all the usual facilities you would expect including toilets, showers, hairdryers, baby changing, laundry and washing up sinks as well as a toilet and shower for the disabled. You can also make use of the family bathroom, with a bath, shower, toilet, sink and baby changing unit and three other family shower rooms, all with toilets and sinks providing families with both privacy and security. Located in a breathtaking cliff top location, Woodhill Park has magnificent views of the coastline and surrounding countryside. It’s the ideal spot to sit back, relax and take in the inspiring natural landscape. 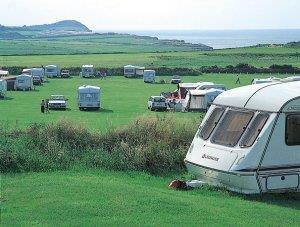 Visitors are also able to hire Caravan Holiday Homes. Family barthroom and thre family shower rooms available Children welcome from any age.